In this issue of Due Vigilance you'll find a set of monster-versus-city rules for pitting your heroes against foes who tower over the skyline! You'll also meet a whole troupe of evil Kaiju and their misanthropic human counterparts. From the undying cruelty of Itaihime, to the madness of Waira the Strange, a variety of fully developed super-sized menaces await within these pages. Or use the provided guidelines on designing Kaiju Kultists and other giant creatures to create menaces of your own! Designed and written by veteran Mutants and Masterminds author Jack Norris, Kaiju Kultists presents six fully detailed villains and a host of other NPCs. Illustrations are provided in full color by Denis Loubet, Denise Jones, and Alex Williamson, including print-and-play standees for all the featured characters. 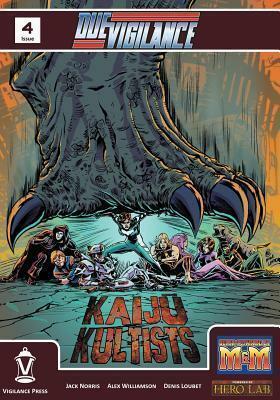 The Kaiju Kultists want to stomp out all of humanity... only your heroes stand in their way!